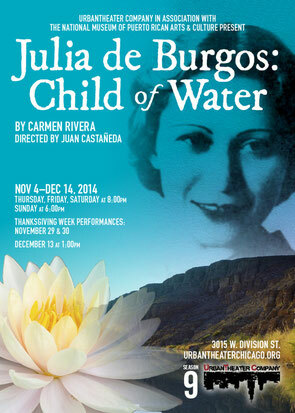 Julia de Burgos: Child of Water to open in Chicago on Nov. 7th. The National Museum of Puerto Rican Arts & Culture is proud to be the main sponsor of Julia De Burgos: Child of Water by Carmen Rivera. The play opens November 7th, 2014 at the National Museum of Puerto Rican Arts & Culture! Tickets are on sale. Purchase a copy of the play at Red Sugarcane Press or on Amazon.com. Julia de Burgos criatura del agua' de Carmen Rivera.. este fin de semana en el Teatro Jesus "Tato' Laviera antiguo Red Carpet Thetre con CarlosEsteban Fonseca, Jmmy Navarro, Georgina Borri, Luis Enrique Romero, amneris Morales como Julia de Burgos y Belange Rodriguez como El alma de Julia. dirige Josean Ortiz. Este viernes 21 y sábado 22 de noviembre a las 8:30 y domingo 23 a las 4:30 en el Teatro Jesus "Tato" Laviera (antiguo Red Carpet Theater), 240 E 123st New York, NY 10035. Para información pueden escribirnos a criaturadelagua@gmail.com o comunicarse al 646-480-7008.